"Protecting What You Value Most"
There is a remote transceiver used to monitor or control a device such as an alarm panel. Each transceiver relays its data in distances measured in miles, to the central receiver via radio transmission. If the transceiver is too far to reach the central receiver directly, it simply hops the data to the next closest transceiver and that transceiver relays it to the central receiver or to the next closest transceiver to the central receiver. 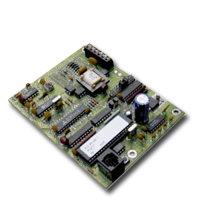 The Central Receiver relays the data to alarm automation software for processing. If data can not be relayed via one route, the mesh network automatically selects the next best route from a choice of up to 8 available routes at any given time. The network dynamically and automatically adapts to changes in the network caused by weather changes, obstruction changes, the addition or subtraction of other transceivers in the network, etc. so that it is highly redundant and reliable. Global Fire & Safety Provides, Owns, and Maintains the hardware free of charge, because we have our own specific FCC Licensed frequency that is used by the Intellinet transceivers. For the One Time Set-Up Fee as little as $95.00, and a Multi-Year Monitoring Contract Agreement of less than $39.95 a month, you will gain the benefits listed above and those listed below. No Need for Telephone lines to be run to your Fire or Security Alarm Control Panel. The 7750 will take care of both your Primary and Secondary communications line as required by NFPA # 72, and your local Authorities Having Jurisdiction. The cost of initial line set-up (typically $100.00 each) and your typical monthly fee of $51.00 are eliminated. The Intellinet system removes these monthly costs for the primary, dedicated Fire line that will only be used in the event of an emergency or once every 24 hours for system status reporting, and eliminates the need for the secondary shared line, leaving you to resource the phone lines entering your building that is best for you and your company. Intellinet completely eliminates the problem of outside phone line cuts or breaks, either by accident or intentional acts of vandalism. Intellinet communicates signals more efficiently and quickly than digital dialers, allowing our monitoring center to know what is occurring with your Fire or Security Alarm system within 15 seconds, allowing a quicker response time. Global Fire & Safety has the widest coverage array of Intellinet Transceivers in Colorado, insuring the highest level of signal strength from site to site. This coverage exceeds any other radio or cell transmission medium. The use of the Intellinet system does NOT alter your basic Fire or Security Alarm Control Panel in any way. Intellinet is a separate battery backed-up communications medium. The overall net savings to you is close $100.00 a month, allowing the initial investment in the Intellinet Long Range Transceiver to pay back in only a few months. Global Fire & Safety is dedicated to the Fire, Security, Access Control, and Closed Circuit Television market in Multiple States. We are factory authorized providers of the finest equipment available, and we employ the highest qualified and certified technicians for installation and service. Call us today and check out the Global Fire & Safety difference. * This price is for digital monitoring only. Please contact Global Fire & Safety for pricing.